Today marks the first day of October for the year 2014. Not that you would know it here...unless, of course, you were looking at a calendar or reading this blog post. Unfortunately for those of us living in Central Florida, it feels nothing like the beginning of October or, more disturbingly, like the season of fall at all. It's still reaching 90 degrees each day, it's constantly humid and muggy (I feel like I've got a layer of sweat permeating the surface of my skin at all times...eww, I know), and it's been torrential downpouring daily for the last 11 days straight. I'm honestly not sure if I'm still in Florida or really displaced to the depths of the African Congo. Dramatic, probably...but coming from living in a European country with such mild weather, I'm basically distraught at the thought that fall, and the feelings typically associated with the month of October, are still far from reality for us here. If you understand any one thing about me it should be that October is my most favorite month of the year (hello, birthday month!!) and fall is my spirit season. Let me reiterate, DISTRAUGHT. No amounts of Starbucks caramel coloring laden PSL's can save me now. So, what do you do when your favorite season is no where in sight? You sure as heck don't go buy all things pumpkin and try to will it to light. I made that mistake in the form of a soup that was too rich and too soon. One step outside to pull weeds and the heat turned my full soup belly into curdled death fire. Not cute. Instead, I'm trying my darnedest to embrace this new life amongst the blazing sun by keeping meals light, airy, and relatively healthy. Because lets face it...as soon as fall does start making a true appearance (I'm thinking December, maybe), I'll be busting out my mac and cheese sweatpants and chomping down hearty stews with the best of them. Until that sweet pumpkin spiced day comes...GUAC. I've really got to thank my Aunt T for this recipe. Every time I make my way back to North Carolina in the summertime, she drives down the road from her house to my parents house (half mile at best) to wine drink & board game it up. Homemade guacamole is always a snack staple and we've perfected the right combination of lime and saltiness. I'm drooling just thinking about the batch resting in my fridge as we speak. Last night, D and I grilled up some chicken, toasted some ciabatta rolls, plopped down some jalapeno jack, and slathered a glob of this guac on top for open faced sammies. NOMS. 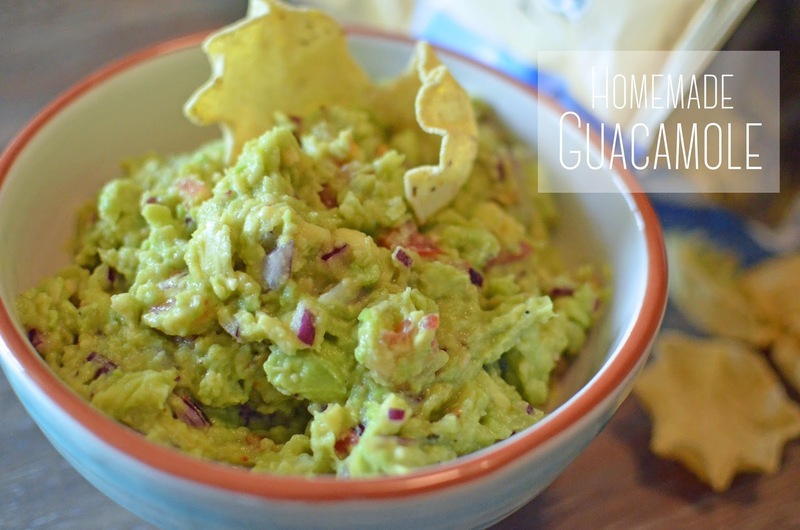 If fall has alluded you as well...this guacamole is here to be your saving grace. We don't need no stinkin' fall. Avocado is the new gourd! 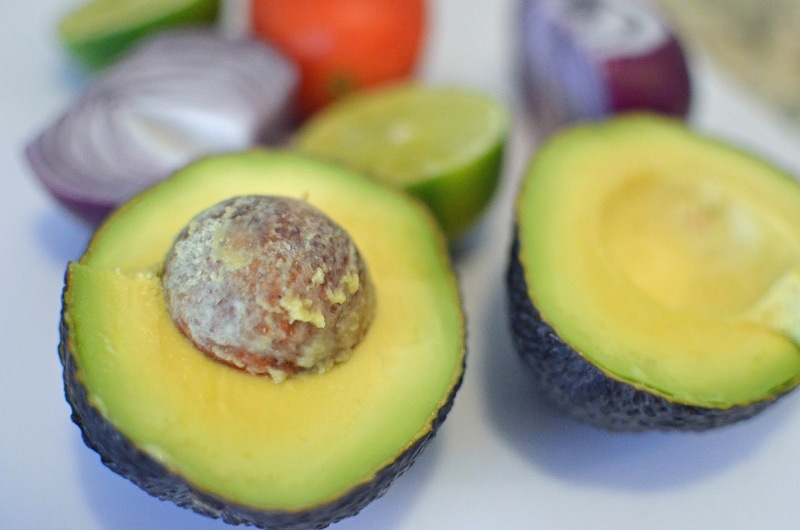 1| Peel, remove pit, and cut avocados into chunks and place into a medium-sized bowl. Squeeze the half lime all over the avocado chunks to keep them from turning brown. 2| Add in the diced onions, tomatoes, and garlic and mash together with the back of a fork. 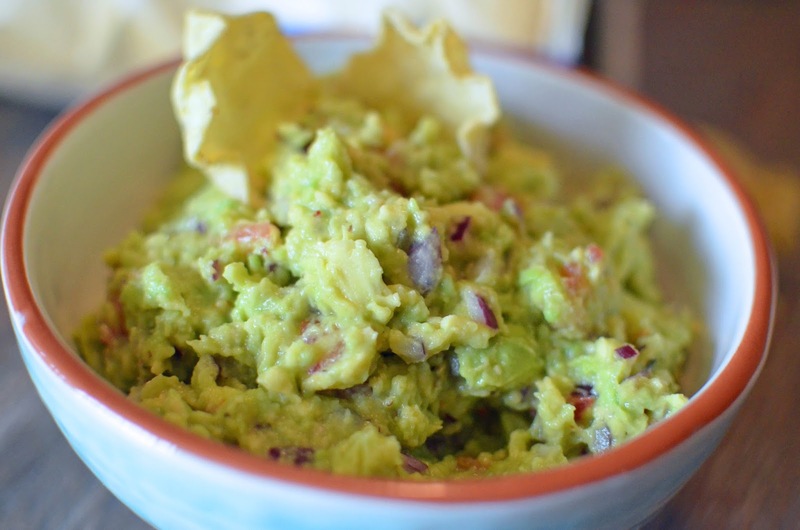 Allow for some chunks of avocado to remain if you like a chunkier guac. 3| Sprinkle in the sea salt, pepper, and red pepper (if desired for spice) and stir together. Enjoy with your favorite tortilla chips! For more fun recipes, check out my CULINARY ADVENTURES page! Guacaholics unite! I'm always on the lookout for new guac recipes to try! Thanks! Ugh, Florida sounds sticky. We were considering a move down there a while ago but I begged my husband not to transfer because I just can't take the humidity. I'm not a beachy, summertime kind of girl. I like dry air and mountains! Aaaaand, guacamole!! Kind of similar to my recipe but with a few twists. I'll definitely give it a go. Looks amazing. It's SO sticky. I am totally a beach bum kind of gal…love living by the sea, but I'm used to North Carolina beaches/weather where the humidity is less frequent and there are more mild days than scorching hot. I'm hoping my body will continue to acclimate, but I don't know how much more summer I can handle! We have just sent you a message through FB regarding our project. Full information has been sent to your FB. Holy guacamole... :) Looks yummy! We're on the downhill slide into Autumn here in IL and I've already made a batch of chili and pumpkin cookies! I'll send some cool weather your way! So going to have to make this. I love making mango guacamole. I'm pretty obsessed with guac too! Hard not to be--it's so so good!! The weather is the same for me, much rain. I like all the rain, hearing the thunder and seeing the lightening. I could do without the humidity. I am a guacaholic as well, I could it a whole bowl with tortilla chips. I am totally a guacaholic. Love this! I just moved to Australia from Arkansas. I totally get the weather thing when it should be fall. Fall has always been one of my favorite times of the year, and we have always had a huge pumpkin carving party every October. In Australia though, we are headed into spring not fall. It is totally weird! Guac on the other hand, I totally agree there! I love guac! Anytime I am feeling home sick, that is my go to meal! The recipe sounds divine! Here in Malta it's still hot and humid, so I feel your pain.. hang in there! I love Guac!!! I've been known to mash an avocado with some lime in a pinch just because... haha is Avocado Addiction a thing?? I love guacamole! I can't wait to try this recipe. Also my cousin lives in Orlando and always struggles with the lack of season (family is from New England) Hopefully the fall weather will come soon! Avocados are my favourite things in the world! If I'm dining out and trying to figure out what to pick from the menu, I'm usually always swayed if the dish has avocado incorporated in to it. Me too!! Love them to pieces. So glad they're a healthy fat! HA! I don't like avocados so I'm not a guac fan, but I would absolutely die if I lived somewhere where there wasn't fall. I hope you get to take a trip somewhere this month and experience it just a little. It is still stupidly hot in Texas too...can't wait to move haha. I could east Guacamole all day everyday...actually, I almost do have it everyday. It is just so good. Ditto! It's pretty much a staple in our fridge these days! Hmm I love homemade guac! My recipe is pretty similar, but I skip the garlic and use lots of cayenne pepper and cilantro. Yum!